Thousands of women gathered in New York March 2-20, 2015 for the 59th session of the Commission on the Status of Women. Having as theme “Beijing + 20,” the session had as its main focus the implementation of the Beijing Declaration and Platform for Action, both the progress achieved and the challenges that remain. It was clear from representatives of both government and civil society that the challenges are many. To have women and girls enjoy full and equal human rights and freedoms enjoyed by their male counterparts is still a goal for all nations, even those with legislation that supports these objectives. In every instance, the implementation of the policy or law, and not its simple acceptance, is what makes it valuable. The reality is that, to a greater or lesser extent, what is lacking in a given country are policies of enforcement, an accountability mechanism and good indicators for monitoring progress. Thus the question turns from enacting legislation to the political will to enforce it and effective strategies for monitoring progress. As an example, even in countries of the European Union, one-third of women suffer from violence and, since there is often no budget to enforce the laws against gender violence, perpetrators often go free with impunity. In moving forward with the post-2015 development agenda, among the questions that need to be addressed are: What is the change we would like to see in the next 15 years? How can women not only be included, but have a position which influences decisions on the highest levels? These issues are important because discrimination against women is deeply rooted in society, feeds a culture of inequality, and can only be adequately addressed with the presence of competent women among decision-makers. Women suffer the most from poverty, lack of education, low salaries for those in the helping professions (childcare, healthcare, domestic service, etc.) as well as from domestic violence and economic violence against partners. Their lack of access to high positions in government or industry contributes to their economic inequality and means their voice is not heard in the chambers that can effect change. It is clear that governments and large corporations are generally more interested in their own economic growth than in caring for the people on whom they depend. The voice of grassroots women is important to call these groups to their responsibility in protecting human life and human rights. Barbara Adams, of the Global Policy Forum, suggested that the slogan for the Sustainable Development Goals (the post-2015 agenda) should be changed from “Leave No One Behind” to “Leave No One Out.” Doing this would shift the focus from the consumerism embraced by corporations and governments to a greater care for and protection of resources so every person might have equal access to basic necessities and human rights, including gender based rights. 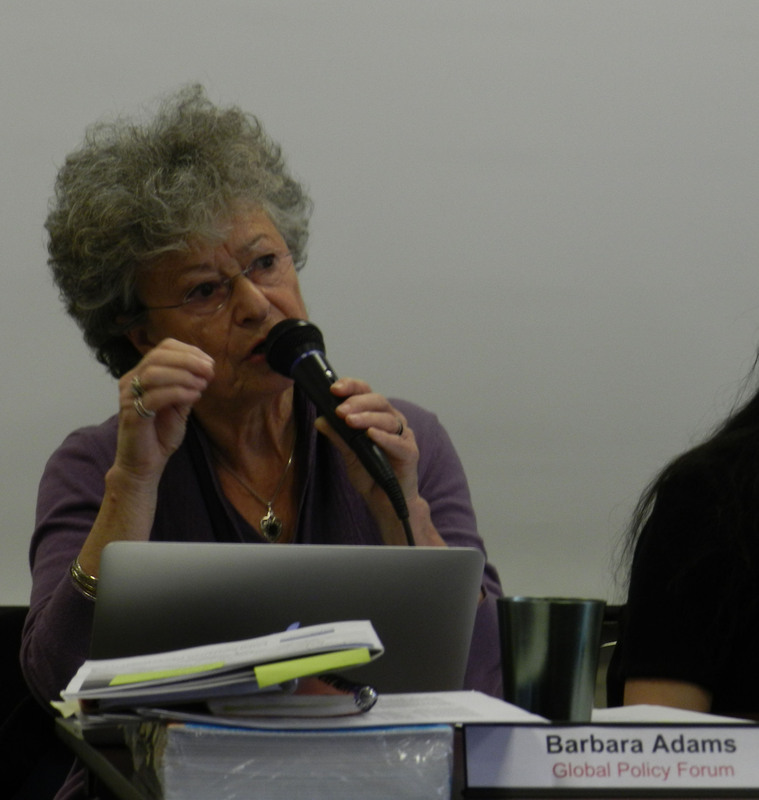 CSW 59 was alive with questions, comments and hopes for the future. It raised the awareness of many participants to issues they might not have previously thought about. And it reinforced the importance of the voice of civil society in creating a world where none are left out.